We thank you for visiting our little spot on the internet as we seek to infuse your week with hope. We are pleased to announce that we will be adding to our little corner of the internet in 2017! 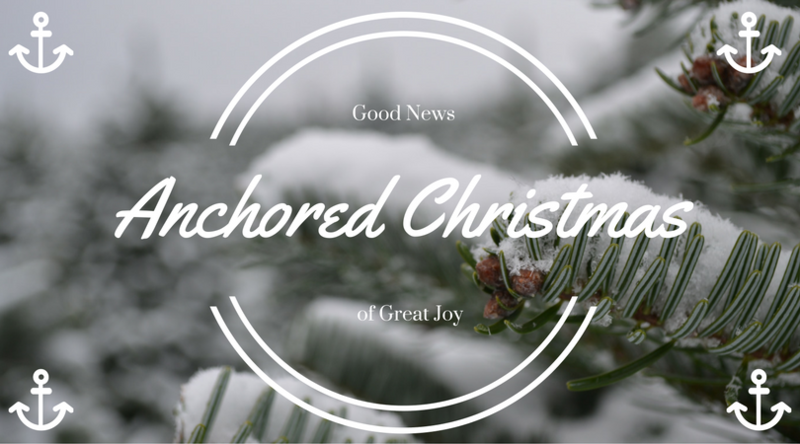 Be on the lookout for new contributors, a book club, and continued stories of faith. More announcements will follow in the coming weeks, as for now we wish you a happy New Year! May our God bless you and keep you, and may His face shine upon you, anchoring your hope to His grace. One last, important update: We are also changing our home. You can now find us at anchoredvoices.com, so make sure to update your bookmarks! 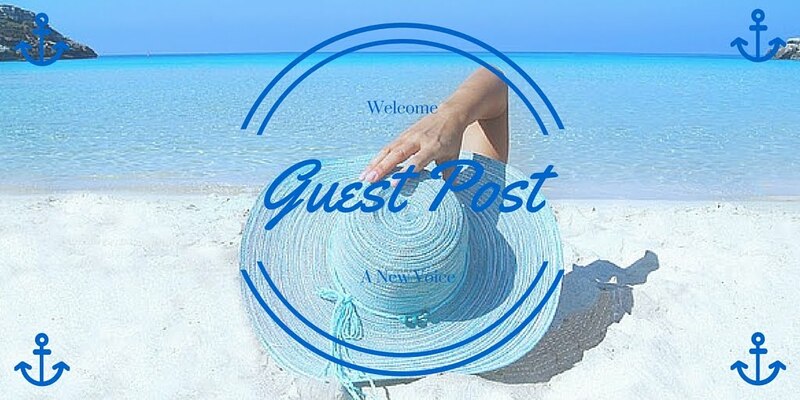 Please come on over and follow along as we begin a new year with hope. I love reading by Christmas tree light. 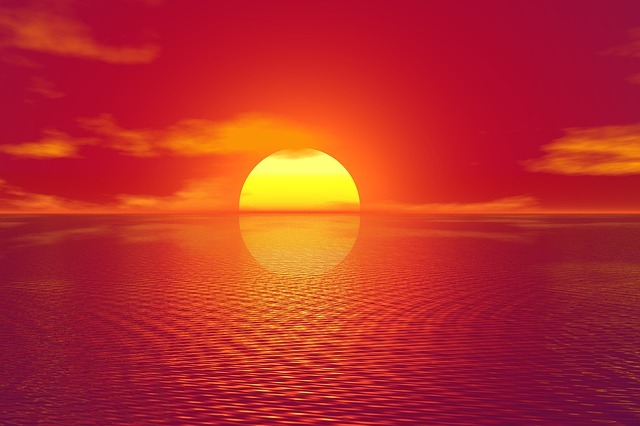 In the faint warmth of its incandescent illumination I feel hope. The gentle radiance enfolds me into a brief retreat during the bustle of the holiday season. The calm soothes in the midst of the distresses of our broken world, and collides with the disquiet hiding in the corners of my soul. I find my mind tranquilly wandering into history and the pastoral suburbs of shepherds living under stars, watching woolly animals breathing in, breathing out. I mull over what those men might have been thinking as they watched the calm repose taking place on the fields in front of them. How could they have known that in the provincial life they had become so accustomed to, they would be met by the miraculous? I long for an angel to appear in front of me proclaiming “Fear not, for behold, I bring you good news of great joy that will be for all the people." Luke2:10-11. I wait for the miraculous in my own life and am sometimes discouraged by the mundane tasks I find it hiding behind. However, I see myself as no more than a shepherd longing to be met by the Savior of the world. Humbled, I am again reminded the ways of God are not (usually) my ways, and find myself dwelling deeply in mystery that is woven together by penetrating truth and profound beauty. Even as a person sure in her faith, peace on Earth seems such an impossible ideal. I am painfully aware of the fallen nature of the world. I cannot fool myself into dreaming about this tolerant peace the Christmas specials preach as trees spring up in homes and plastic Santa faces watch through snow-flocked windows. I know Jesus brought peace to Earth that night in the city of David, but I can't help but wonder if He took it with Him when He ascended into heaven? His presence through the Holy Spirit provides rest for all that seek Him, and salvation for those He calls His own, and yet, peace seems elusive; rumors of wars, racial injustice, and unspeakable terror plague our daily existence. I am assured of the peace within my soul, but peace on Earth? Jesus told us ""Let not your hearts be troubled. Believe in God; believe also in me. In my Father's house are many rooms. If it were not so, would I have told you that I go to prepare a place for you? I will come again and will take you to myself, that where I am you may be also." John 14:3. We are promised peace, in its fullness, is coming to Earth once more, and He has made room for us to join Him. This anticipation, this wondering what it will look like, and this falling asleep begging Him to move, all point me to that baby in the manger who grew to be the savior on the cross. Seeing Him gives me the strength to engage in moving towards peace by praying for patience and holding tight to His word as carols hang in December's crisp air. 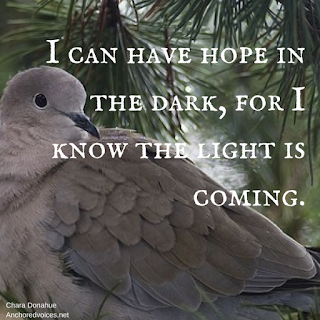 I can have hope in the dark, for I know the light is coming. Widowed father of six and literary great Henry Wadsworth Longfellow endured in his asking for a harmonious world and goodwill towards men as He listened carefully to holy cantatas calling through the noise of the Civil War. Through sorrow He wrote "I Heard the Bells on Christmas Day" from the hospital bed side of his severely injured son, a war time Lieutenant. With peace on earth, good-will to men.'" When the heaviness of the world presses in, I can turn to the mighty promises of a Living God for strength. He cannot be shaken, so I am emboldened to move forward as a peacemaker. 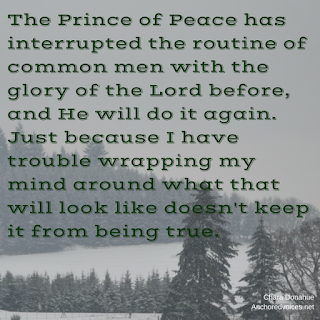 With great joy I offer myself as an ambassador carrying the promise of powerful reconciliation, because this hope I have—the Prince of Peace has interrupted the routine of common men with the glory of the Lord before, and He will do it again. Just because I have trouble wrapping my mind around what that will look like doesn't keep it from being true. So, come Jesus, come. I want to believe. I am praying for peace on Earth. Readers, Whatever Christmas looks like for you this year, remember there is no greater gift than the one that is yours through Christ Jesus. Whether your Christmas season has been filled with sorrow or joy, the hope that is yours through Jesus cannot be shaken. Christmas is the celebration of the redemption of God breaking into dark places. Fear not, He has overcome and because of that there is joy! Chara is a freelance writer, certified biblical counselor, and speaker. 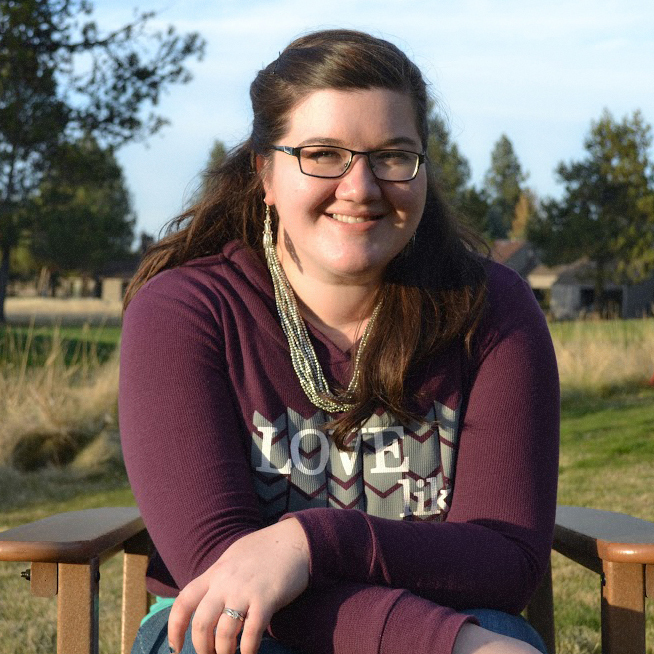 She holds a MSEd from Corban University and is passionate about seeing people set free through God's truths. She loves to write about faith, culture, and the deep truths that drive our fascinations with it. 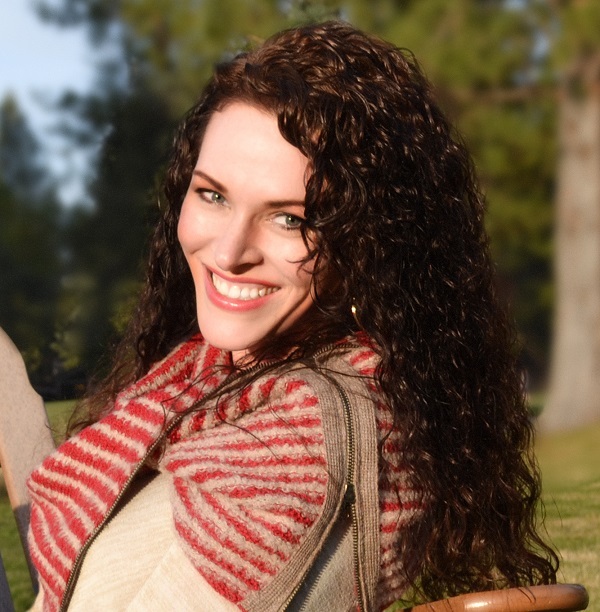 Chara is the founder and editor of Anchored Voices and can be found on multiple social media platforms @CharaDonahue. Confession: Christy Nockel’s Thrill of Hope Christmas album has been on repeat in my car since the beginning of November. The Advent Hymn, specifically, resonates with my heart in a time of waiting. I imagine the shepherds singing this type of song with baited breath night after night into the early morning hours aching for the Christ to be born. He would be King, the one they had waited for—their soul’s longing. Advent is a time of waiting. 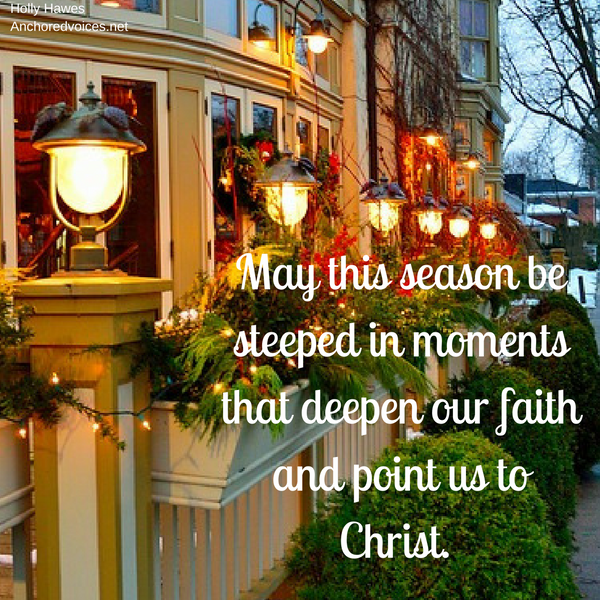 It is the period prior to Christmas in which we anticipate Christ’s birth. We are given the opportunity to look at the works of God in the Old Testament and reflect upon the prophecies that heralded a coming Christ. The book of Isaiah is filled with these hope-filled forcasts, chapter 7, verse 14 promised, “Therefore the Lord himself will give you a sign. Behold, the virgin shall conceive and bear a son, and shall call his name Immanuel.” Isaiah foretold this 700 years prior to Jesus’s birth in Bethlehem. I, too, am like the shepherds, with a heart song echoing lyrics similar to those above. I have hopes and dreams unfulfilled and know I am not alone. I know other single gals who desire marriage, wives fighting for their marriage, the happily married wondering if they will ever become mothers, and mothers who have lost children. I have prayed for mothers anxious for their children to return to the Lord after stepping away from their childhood faith, women battling sickness, and those who can’t see the way out of their addiction. These friends are asking ‘Dayspring from high be near’ as they wait for families, for reconciliation, for healing. Waiting is bittersweet, and sometimes painful. And just because we wait doesn’t always mean God gives us our expectant hearts’ desire. But,“The Lord is near to all who call on him, to all who call on him in truth.” Psalm 145:18. 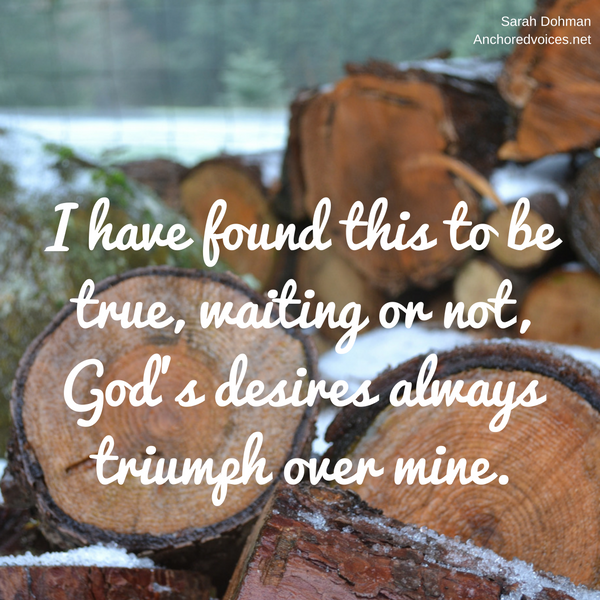 I have found to be true, waiting or not, God’s desires always triumph over mine. He knows what is best for me. He is seeking and pursuing my heart. Always. As the shepherds watched the evening sky for a great light (see Isaiah 9:2), God spoke to their hearts. He spoke of Hope, and encouraged them to hold to that Hope, no matter what. We learn in periods of waiting. If you find yourself identifying with my own feelings of anticipation this Christmas season, I want to encourage you. 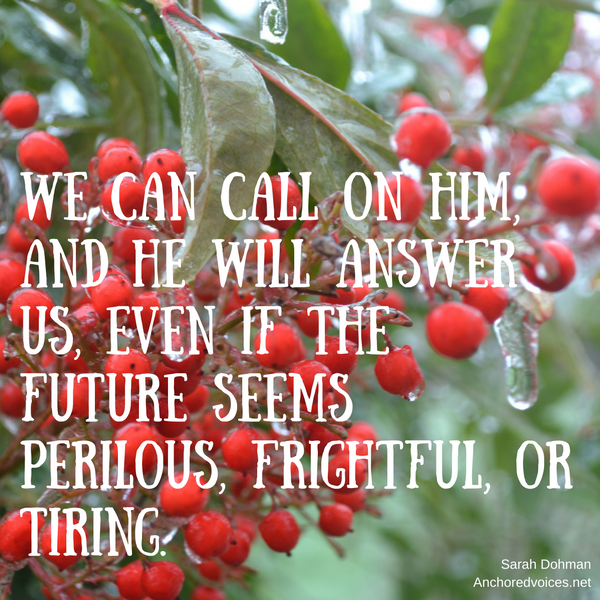 We can expect God to meet us in our time of waiting with comfort and peace. 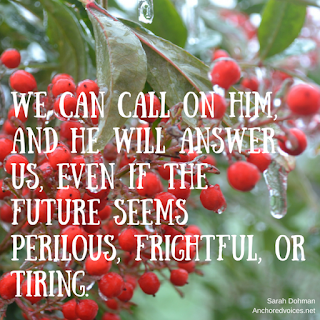 We can call on Him, and He will answer us, even if the future seems perilous, frightful, or tiring. Readers, I will prayerfully join you in this time of waiting. I will ask God to be gentle with your heart and give you a renewed sense of Hope this Christmas season. Tell us how can we pray for you? Sarah believes God has called her to this space to bring joy and encouragement through words to friends and family, near and far. You can find more from Sarah at her blog, and you can find her stories for Anchored Voices under the tag Sarah. When pine trees and baking supplies started making their way into my home as a young child, I, accompanied by my stealth-like snooping skills, made my way to my mother's best kept hiding places. I was a peeker. A present-peeker to be precise, and Christmas mornings were filled with anticipation not because of the surprise that awaited, but because I already knew what the wrapping cloaked. I couldn't wait to get my hands on the toys I had already previewed. As a wise single mom, my mother would intentionally start purchasing gifts months ahead of time, so her budget could handle blessing her three children. This gave me plenty of time to seek and find. I would climb over dressers and toss sleeping bags that shouldn't have been touched till summer all in an effort to spoil her surprise. I never once wondered "Will we get anything?" What I didn't understand was the amount of sacrifice my mother made to ensure that we never considered questions like that. 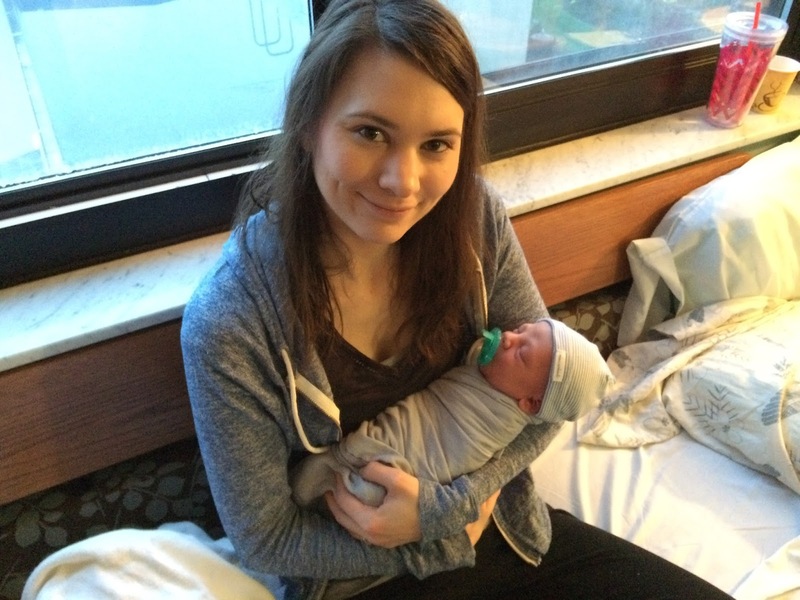 Now as a mother of four, I marvel at all she did. Breaking up my children's tiny-bodied, big-voiced arguments, instructing them in life skills like using a toilet, and trying to teach young hearts about maturing faith can leave me feeling exhausted, but my husband is in the thick of it with me, tagging in when I tap out. My mother held to Jesus and persevered. As her children slept, she pushed through exhaustion to correct the homework I finally did, sew the flags my sister spun, and figure out how she could afford to buy her son's first instrument, who (unbeknownst to her) would one day play at Carnegie Hall. 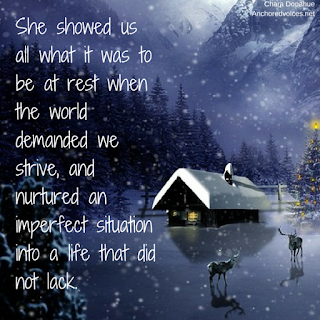 She may have been a single mother, but she offered us a home that felt complete, whole. She changed my sister's diapers and attended my brother's games. She pulled me away from parties and lifted us up with prayers. She showed us all what it was to be at rest when the world demanded we strive, and nurtured an imperfect situation into a life that did not lack. Sneaking through my house as a child, I wasn't aware that our most precious things were not things at all, but memories, people, and faith. I was too distracted by the deluge of bows, desserts, and carols to see my mother draw strength from the baby depicted in the old wooden manger she put on display through out the holidays. She offered me the luxury of being so busy with childish things that I forgot to be thankful for her unwavering determination to create a home that offered sanctuary from the harshness of the world. 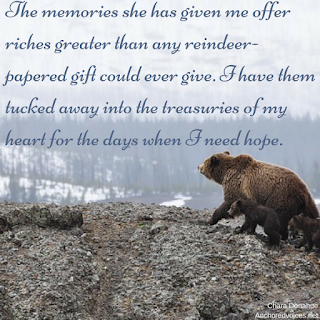 The memories she has given me offer riches greater than any reindeer-papered gift could ever give. I have them tucked away into the treasuries of my heart for the days when I need hope. I will always be grateful for the worn Bible that often laid open upon her bed, her constant presence, and the way she offered children who had experienced deep sorrow a place of peace. Readers, Are you a single mom? Thank you for all you do. I know it's not easy, but those kids will someday be grateful. They just got to grow up a little ;). Do you know a single mom who could use some encouragement today? How could you be the one to offer it? Last year, when Christmas tunes began to ring out from the radio, our mostly quiet family of three became a raucous party of seven. My husband and I have one teenage daughter and, while we weren’t on the list for emergency foster care, four siblings (ranging in ages from 7-15) were delivered to our home during a crisp late fall morning so they could spend the holidays together, connected. As we folded new family members into daily life, I realized they knew very little of the true story of Christmas. The way in which we celebrated Christmas was drastically different from what these kids commonly expected. The holiday season became a time of learning about these kids and their traditions, and articulating our own. 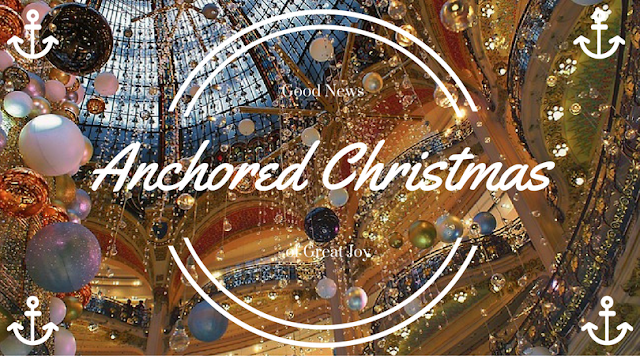 Christmas for us tends to go deeper than the kinds of food, type of music, and activities we participate in. As we explained that, we began to see opportunities woven throughout our days to speak the truth of God’s grand plan to seek out, love, and mend hearts. God instructed his people in Deuteronomy 6:4-8 to teach their children of Him in all aspects of life, to let the everyday moments become meaningful. 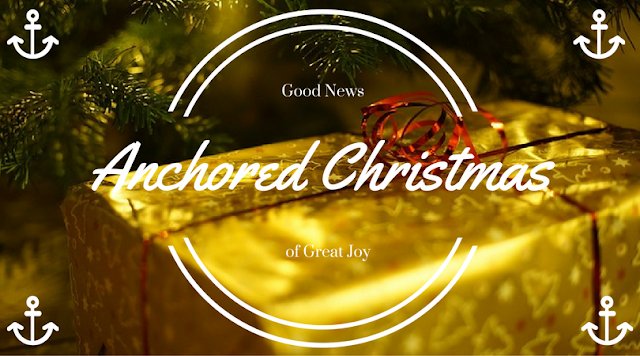 We too can speak the good news throughout our days, sharing that the Savior came in the form of a fragile baby who would change the world. 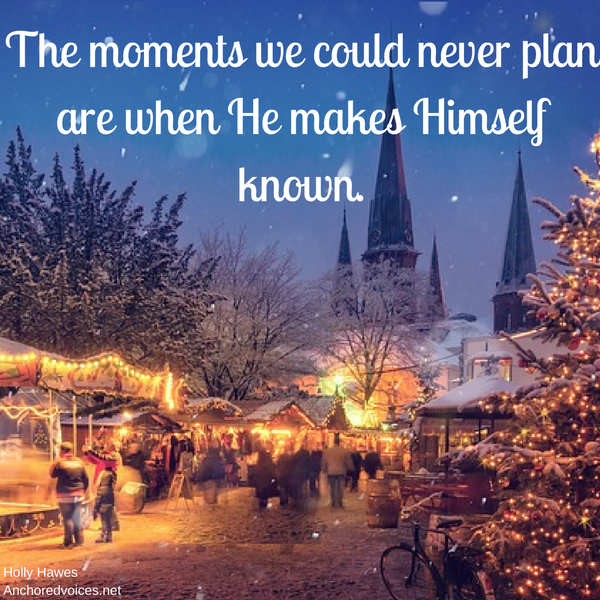 There may be no other season that presents more opportunities to connect the dots between our lives and the story of God in a way that deeply matters to our children, our neighbors, and our own souls. To be honest, I didn’t plan to have any of the conversations that came about. Instead, the light of the world began to illuminate in the moments I least expected. In the car the youngest exclaimed “Jesus is the King of Love,” as she remembered the lyrics to a song she had heard. On another occasion, as we were hurrying along, the preteen asked me in a public restroom, “Why is it important that Jesus was born. Wasn’t he just another baby?” I didn’t expect to get to explain the whole story of redemption as we washed our hands and talked over the whir of the electric hand drier, but I had the privilege to do so. Isn’t that exactly how God intersects with our lives? The moments we could never plan are when He makes Himself known. Though these siblings were able to be reunited with family by the time Christmas morning arrived, I came away from the season acutely aware of the meaning of each moment. The real story of Christmas just needed to be pointed out. Not in a grand production, or lengthy speech, but in the simple moments wherever the Holy Spirit brought about a connection. Today, may we ask God to illuminate the places where His overarching story of glory and grace melds the mundane moments with the eternal epic. May God connect the dots of the busy with the dots of the meaningful. Let us ponder with awe the baby in the manger and share with glad and sincere hearts of the hope He brings. May this season be steeped in moments that deepen our faith and point us to Christ. Readers, How do you share the true meaning of Christmas with those around you? Tell us in the comments. It was Thanksgiving Day. My husband Matt and I were at my in-laws, busying ourselves with laughter, food prep, and good conversation. Finally, the time came to eat. All the smells that had been tempting us for hours were about to be enjoyed. The food was set out buffet style in the kitchen, and we lined up one by one, each person grabbing a plate and creating mountains of mashed potatoes and turkey. I took a plate and held it out for Matt, but he wasn't looking, he was on his phone. I rolled my eyes, thinking he was playing a game or checking NFL scores. But no, he had a missed call from our adoption case worker. Confused, we snuck off to another room to call her back, and heard the most unbelievable news I ever heard. We had been chosen by a birth mother. 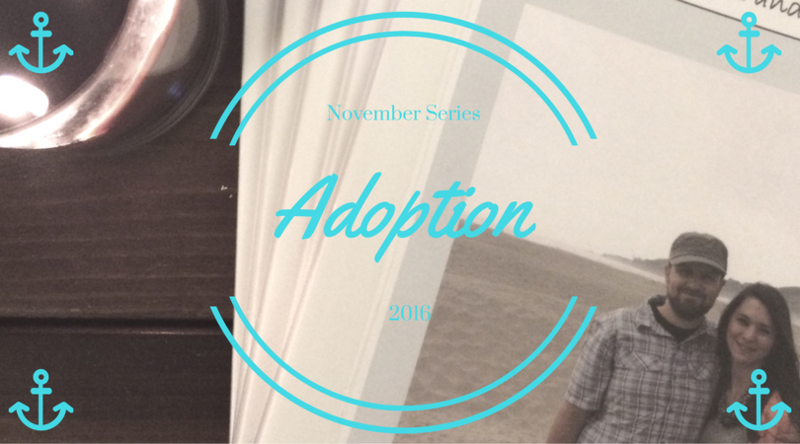 Eighteen months before that our adoption process had started. And the three years prior were full of doctors visits and no explanations. This process was full of uncertainty and hard work, which meant this control freak had a hard time not being in the driver’s seat. 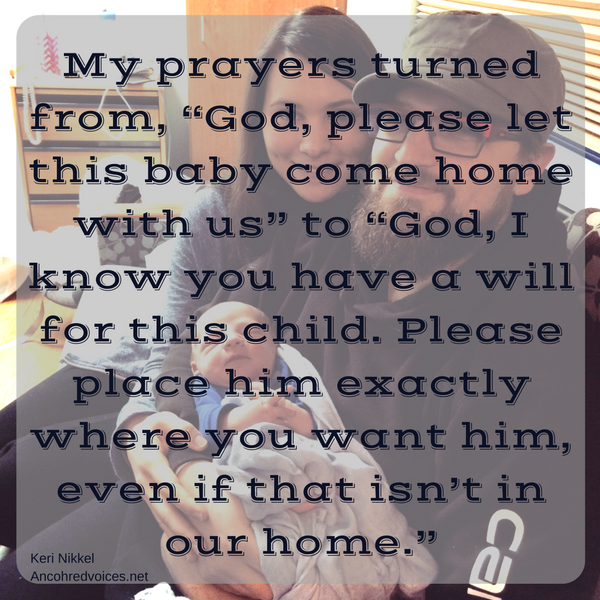 We experienced multiple delayed training classes, desperate fundraising to make the next big payment, a home walk through on our anniversary, and being one of 18 families waiting for a child. By the time we got the Thanksgiving call, we had become accustomed to waiting. And during the wait, I learned what God already knew, that I needed to experience that burdening season so I could learn that only He had control. 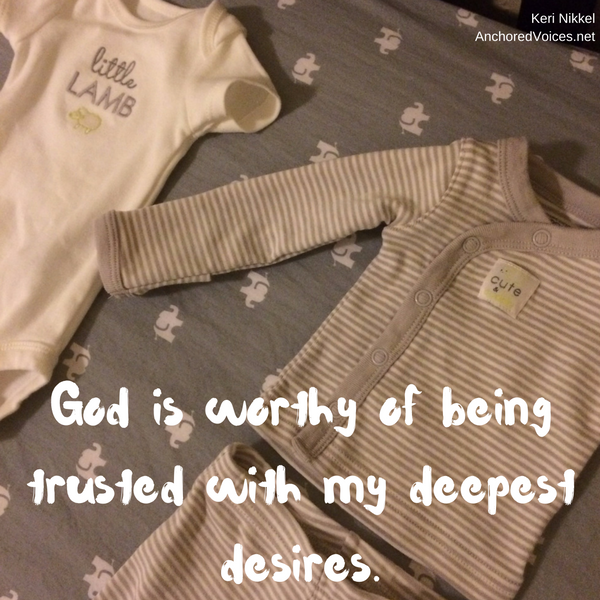 He is worthy of being trusted with my deepest desires. Twelve weeks passed between that Thanksgiving call and the time of the birth. That may not seem like much, but the anticipation and uncertainty made it feel like eternity. We loved on and built a relationship with the sweet woman who chose us, and were honored to be invited to witness her pastor pray over the unborn babe. Although, I could feel God strengthening us and leading us forward, I still felt like I was holding my breath—waiting for something to go wrong. Each day the enemy was quick to tempt me to be swallowed up by fear, and each day I had to make the choice to trust that God was bigger. Valentine’s Day was a Sunday. We went to church, holding secret that induction would be happening the next morning. Making small talk, all the while trying not to be constricted to death by uncertainty. Afterwards, we headed home, packed the car and drove to the town where she lived. Tossing and turning most of the night, we woke early and made the 10 minute drive to the hospital. The short drive felt like a never ending tunnel. I sat in the passenger's seat, wringing my hands until we saw the tan brick building. We parked the car, slowly walked in and joined our case worker in the waiting room. After two days of feeling all the feels and caring for a sweet baby boy, we took the two hour drive home as parents. The selfless love of a mother was the way I became one, and the details leading up to us bringing our son home minister to my heart every day. God also gave me an overwhelming love for a woman who chose life for a child who calls me Mama. And a trust in Him, that gives me courage in uncertainty. Our lives have changed, and so has my faith. Not because this time I got what I wanted, but because God helped me learn to trade in fear for peace, control for obedience, and sadness for joy. 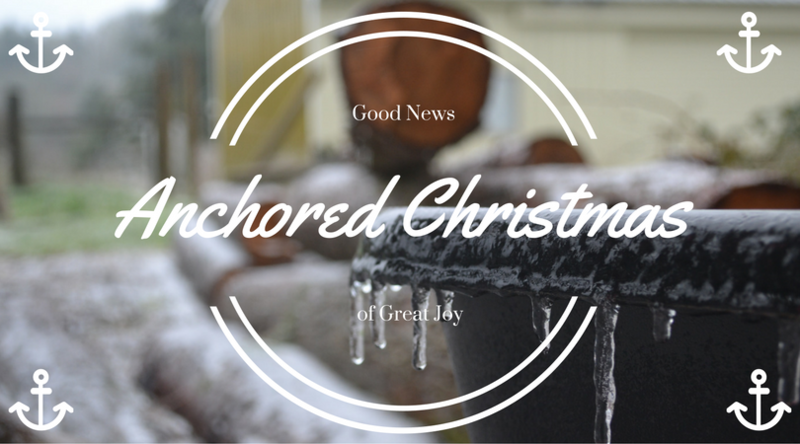 Readers, Do you have a story of how God showed you hope in a tough circumstance. We would love to help you share it. Check out our submissions page for details. 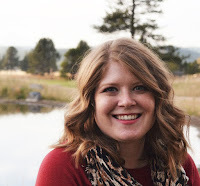 Keri is a wife and new mama, who loves Jesus and believes we are all given a story that can be used to encourage others. I see you raising money by creative pursuits and unique inspiration. The t-shirts, the puzzle pieces, the jewelry, and the garage sales. I have seen your friends sell their possessions to help you pay for your adoption. I see how much it costs to adopt a child, and yet, you do not complain. I see your trust in God’s provision. I see the hope you have for bringing home your child. I see you waiting years for your child, without hesitation. I see you loving your adoptive son or daughter exactly as if they were your biological child. You are seen. Sweet adoptive parents, the beauty of this passage is that God chose us — He predestined us. We are adopted by God the Father, just like you adopt your son or daughter. 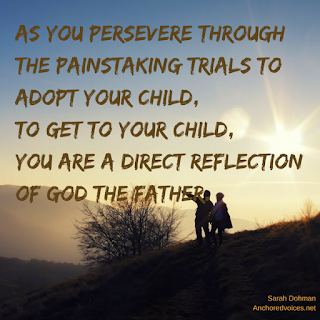 As you persevere through the painstaking trials to adopt your child, to get to your child, you are a direct reflection of God the Father. I am a firm believer that the child you adopted is specifically hand-picked for your family. 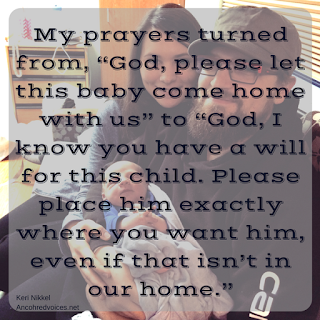 I hear your prayer requests, and I will not stop praying until your child comes home to live with you. I see your efforts in raising money to bring home your child, and I will support you in doing so with time and money. I hear you share your challenges as you raise your son or daughter, and I have hope for you as your family begins to meld together. I see you raising your sons and daughters. 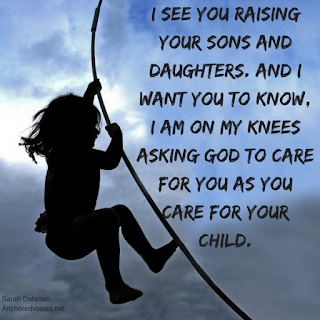 And I want you to know, I am on my knees asking God to care for you as you care for your child. Adoptive parents, my dear friends, you are precious. You are called. You echo the heart of God. 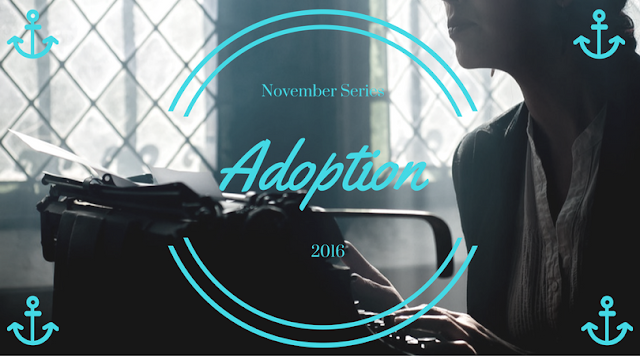 Readers, Do you see the needs of adoptive parents? Consider how you could help today.